I'm sure you all know what the 3DS is and what its feature does by now: display 3D renders without the need for special glasses. Killing the 3D-glasses industry since... now! When asked, most people said that the 3D feature is just a gimmick and should've been left out in favour of better hardware but that hasn't stopped Japan from shipping 400.000 of 'em as of February. Of course, I myself thought this at first too, until I saw it in actual action. More on that later. "We will recommend that very young children not look at 3D images," Fils-Aime said at the time. "That's because, [in] young children, the muscles for the eyes are not fully formed. This is the same messaging that the industry is putting out with 3D movies, so it is a standard protocol. We have the same type of messaging for the [1990s Nintendo virtual reality machine] Virtual Boy, as an example." So, as long as you don't overdo it and marathon Street Fighter in one session, you'll be fine. Regardless, how does the 3D really look like though? Having played arond with it for a bit, I can say that it performs as it says. The 3D effect is remarkable, showing actual depth between the dimensions. The strength of the effect is adjustable with a small slider, saving battery power and being easier on the eyes. The 3DS comes with a built in game called "AR Games", using Augmented Reality. In easier terms: using the built-in frontfacing cameras you can make things appear (on screen) that aren't really there, in a way that makes it seem real. You also get "AR cards" with your 3DS which make classic Nintendo characters appear. Sounds complicated, but it's a lot easier than it sounds really. Let's get to the two stereoscopic cameras. You can take 3D pictures with them and hell, they're really 3D. Hard to describe in words, but I'll try: "OMG, wow!" My only complaint with the camera(s) is that you need a relatively bright surrounding, or you'll see some serious artifacting. What's also really missing is an actual video capture mode. When taking pictures, you can see the 3D working away onscreen, which in itself is quite brilliant. But you can't record that. Bummer. Personally, that's a selling point. 3D is a nice thing to have on a mobile gaming console, but why have the option to take pictures (in 3D!) and not videos? I understand that it's most probably in the hardware limitations, but still. Nintendo isn't known to bring out the best of games at launch of a console, just look at the Wii. Toted to be the best thing since non-motiontrack consoles, we hardly ever saw that many games that weren't for kids or just plain boring after 5 minutes. 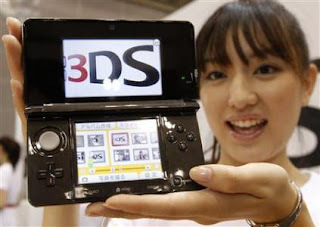 I'm hoping that we'll see more releases for the 3DS though, what with it being the best thing since non-3D consoles. Great informative blog! Man, it made me miss my GameBoy. I haven't had one since the GameBoy Pocket! Talk about old school. Great post, I dunno if I want to go out and get one or not...maybe once more games come out. I imagine I'd get a headache from this. I hope I never have to use one. It's an interesting machine, but I have to wait for more games before making any decisions for buying it. I've really been wondering how exactly these work, as it seems a little advanced. Then again I'm a '90s kid, I still remember when N64 first came out. I really am against 3D in movies and games. It really just annoys me more than anything else. Its official, I want one. I really don't enjoy 3d movies, but this looks pretty cool! I'm still kind of skeptical though. solid review, if they aren't to expensive here ill may get one. Tried one out in a local toy store. It was cool, but not awesome. Not worth the money (yet?) imo. I have to say that the PSP2 holds my interest more.